The Fall Luncheon shines a spotlight on the school-readiness crisis and helps to raise funds to support Jumpstart’s work to close the educational achievement gap. Our Fall Luncheon will take place on November 13th and will feature a diverse, female Writers Panel of award-winning and bestselling authors, including Min Jin Lee. 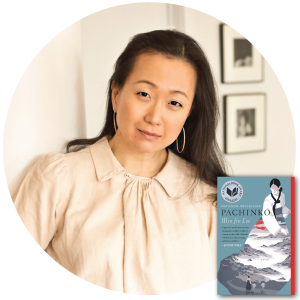 Her bestselling novel, Pachinko, was a finalist for the National Book Award and was named Book of the Year by The New York Times, USA Today, the BBC, and New York Public Library. In today’s blog, we speak with Lee about her love of books and inspiration for becoming an author. There is a growing understanding that we need more diverse representation of authors offering a wider range of viewpoints and experiences to create literature that resonates with everyone, and this is especially true with books for young people. What else do you think we, as a society, need to do to make books more inclusive and accessible, and what do you see as your role in contributing to this? We can make public libraries more accessible to all of our neighbors: native English speakers, immigrants, and those who read in other languages. If we can get adults and the children in their care into fine libraries, then we can support our readers and nurture our neighborhoods. As a writer, I want to do my best to serve all kinds of readers—those who borrow books and those can afford to own books in their homes. Literacy is one of the greatest ways to empower a community and to strengthen the finest values of democracy. I think I felt like a real writer after I published my first book [Free Food for Millionaires]. That said, I believe you are a writer if you write—publications or no. This took me a while to figure out. Congratulations on the accolades for your recent book. Can you tell us a bit about Pachinko and why you set out to write this story? Pachinko is a historical novel about one Korean family that immigrates to Japan and remains. I set out to write this book, because I was profoundly affected by a story I heard in college about a Korean-Japanese boy who was bullied by his Japanese classmates. I wanted to understand the nature of enmity, love, and struggle. I love to draft and revise. I enjoy creating scenes and revising at the level of the sentence. What advice would you give a young reader struggling to find their way with words? I hope that young readers can fall in love with words and eventually wish to make them their own. The mastery of language is a form of power, and I wonder how that is understood and taught today. Rather than studying, I hope that young readers can learn through the sheer joy of entering new worlds through books. I loved to read as a child and enjoyed books far more than the real world. Once I moved to America, I read a lot of Lois Lenski and Maud Hart Lovelace—old fashioned stories, which have stayed with me. We can’t wait for you to meet Min Jin Lee on November 13 at the Fall Luncheon! Click here for tickets and more information.